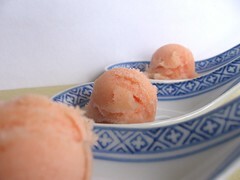 Guava Sorbet - Do You Know The Muffin Man? Notes: Using a carton of COPA guava nectar (45% fruit), I made this extremely simple recipe as directed but omitted the zest as I didn't want little bits in the sorbet. It's a little too sweet, but it's hard to control for the sugar in the nectar. The tropical fruit flavour is very evident.